The new Megane cabrio has a larger folding roof than its predecessor. RENNES, France -- Renault aims to build on the sales momentum of its new Megane range by launching a convertible version with new features to help the model compete better against rivals from Peugeot, Volkswagen and Ford. The Megane Coupe-Cabriolet, which launched this month, is the sixth and final version of the new Megane family that also includes a hatchback, coupe, sedan and the Scenic and Grand Scenic minivans. Renault has added features such as a larger electric panoramic folding glass roof and a more reactive power steering system on the Megane convertible to boost its chances against rivals such as the Volkswagen Eos and the Peugeot 308 CC. 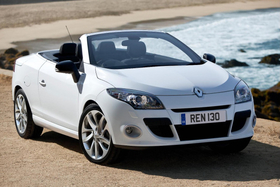 The annual market for this class of open-top coupes was almost 100,000 units last year in Europe, according to Renault. The company hopes the Megane convertible will be in top three in the segment by the end of next year, Nicolas Peant, a Renault product manager, told Automotive News Europe at a press event here. While the Megane convertible is a niche product, the four-seat car will help boost the Megane family's overall market share in Europe in the compact segment. Previous versions of the convertible represented four percent of the Megane family sales and 10 per cent of Western Europe's compact convertible sales last year, Renault says. The Megane series also continues to generate higher margins than Renault's smaller Twingo and Clio models, Peant said. Renault said it sold 463,000 Megane-based models worldwide last year, compared to 452,00 units in 2008. The new Megane range was launched late 2008. The Megane convertible will be offered with six gasoline and diesel engine options including a 2.0-liter gasoline engine with a continuously variable transmission (CVT), which Renault says is a first for the latest-generation Megane range. Launch date: June (Europe), other global markets by year end. Main competitors: Peugeot 308 CC, Volkswagen Eos, Ford Focus CC. Annual production: 40,000 units a year. Base price: 24,900 euros (France). Best bits: Large folding glass roof that can be lowered in 21 seconds and a wind deflector that reduces wind noise and turbulence at speeds up to 90kph (56 mph). The car's folding glass roof, made by Germany's Karmann, is 10 percent larger than that of the previous-generation at almost one square meter. Renault expects that more than 90 percent of Megane convertible sales will be in Western Europe, although the car will also also sold in South Africa, Australia and the Middle East. The main target group for the car is couples aged 50 or older with grown-up children. Primary drivers are women, Peant said.